Back in my childhood, when the world was full of exciting possibilities, and there were wondrous sights everywhere, I remember my first tryst with Innovation. My mum was really high on knives; we had many of them for slicing, dicing, chopping and the like. With her serving us delicacies with every meal, the knifes had a busy time. But like everything else around my mum, even the knives were nurtured and loved, receiving their timely 'Spa' treatment. The 'Spa' was in the form of the bell toting, knife sharpening bicycle guys who used to provide the doorstep service of sharpening your knives for you. I remember accompanying mum to the knife sharpener who had set his temporary base downstairs. He was swarmed by the women of our locality, and like most vendors/businessmen who could keep their composure and acumen even when surrounded by a dozen haggling ( at the same time, mind you) women, he answered all of them patiently, diligently while going about his business of giving new meaning to the blunt lives of our knives. While this in itself was a remarkable multi tasking feat, I was enthralled with how a simple transportation device had been converted into a service provider and a means of livelihood for an indigenous, hard-working man. Attached to the driver wheel was a conveyor which transmitted the circular motion to a grinding wheel; something I would later on study/use/fool around with while using a portable surface grinder. 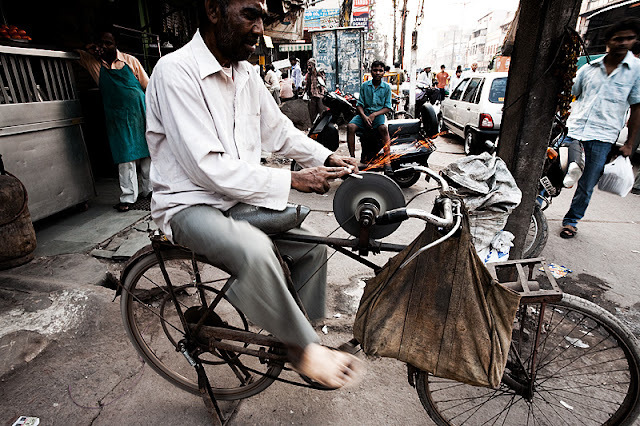 The man pedalled at different speeds to generate the desired motion on the grinding wheel, something I imagine would be a tough and highly labour intensive thing to do for the whole day. In the end of his mammoth effort which at times lasted an hour or so, he would request for a tall glass of water, and cycle away to his next destination. He made no appointments, didn't carry a laptop or a smartphone, but his mind knew which area he had been to when, and when his services would be required periodically. His publicity was also not through social media campaigns, or TV ads, it was good ol' word to mouth. I would credit the Knife Sharpening Cycle guy to open my mind to the wonderful world of machines and innovation. What forms of innovation have you seen?